KNRUHS MPH course Merit list, Counselling dates, Certificates verification 2018/ KNRUHS Counselling notification for admission into MPH Course 2018-2019: KNRUH MPH Courses Admissions - KNRUHS MPH course Results, Counselling dates for Master of Public Health Admissions : Online Application forms were invited from the eligible candidates for admission into MPH course through Computer based online Entrance Test and for the year 2018-19 for the seats in College affiliated to Kaloji Narayana Rao University of Health Sciences, Warangal. MPH Course entrance exam was held on 19-07-2018 and its results was declared on official website. This is to inform to all the successful candidates who appeared in the common Entrance Test for admission into MPH course held on 19-07-2018 that, the counseling for convener quota followed by management quota will be held on 07 September 2018 at Prof. G. Ram Reddy Centre for Distance Education, Osmania University Campus, Hyderabad (PGRRCDE,OU-CAMPUS, HYDERABAD). Merit list is displayed in KNRUHS web-site. All the candidates are here by directed to attend for counseling along with original certificates for verification and they should pay the prescribed fee as mentioned in page No. 16 & 17 of the prospectus. They should report at PGRRCDE, OU CAMPUS, Hyderabad by 10 a.m. on 07 September 2018. All the candidates who qualified in the MPH Entrance Test for admission into MPH course for the Academic year 2018-19 are only eligible to attend the counseling. 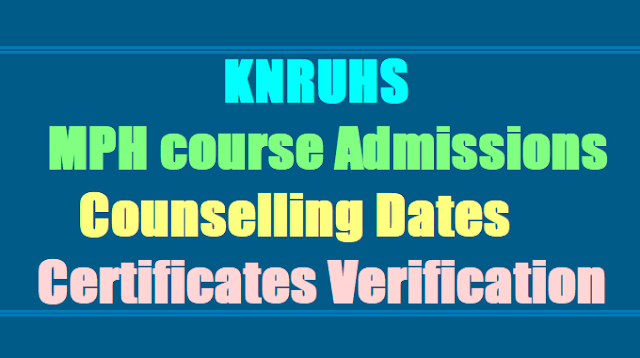 All the candidates as per merit list displayed on KNRUHS website are directed to attend the counseling. www.knruhs.in on day before the counseling. 4. Fees once paid cannot be refunded under any circumstances. viii. Any other certificates as per regulations.